Welcome to Chanooka Brave's website! Online Registration is now open for all Regular Season Cheer, Dance, and Football programs. Click here to Register Online now! We have also introduced a Dynamite Level which will accomodate the younger players for football and cheer! 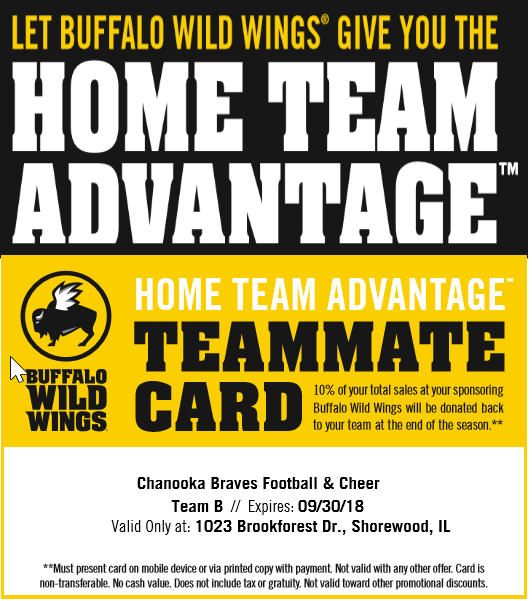 Chanooka Braves has been selected to participate in the Home Team Advantage Program with Buffalo Wild Wings. If you plan to eat at Buffalo Wild Wings between now and the end of September print out the Teammate card and bring it with you. Buffalo Wild Wings will then donate 10% of the purchase to the Braves. This program is an excellent opportunity to raise additional funds for the organization.